‘Before this experience, I was listening but I wasn’t hearing’, reported one of the participants in the BASICS program. She was testifying to the impact of sharing sacred texts with a group comprising people of diverse religions and nationalities through the technique of bibliodrama. Her experience was echoed by dozens of participants, who all reported increased awareness of and sensitivity to the values of the religious ‘other’. 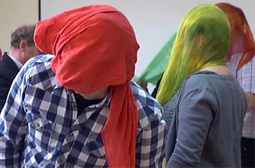 In October 2011, Elijah became a joint recipient of a grant from the Grundtvig Lifelong Learning Program of the European Union, with the aim of exploring the use of bibliodrama as a technique for intercultural or interreligious dialogue (BASICS). Since the inception of the program, Elijah has worked with partners in Poland, Hungary, Iceland and Turkey conducting workshops and training programs for groups of Christians, Muslims and Jews. The exploration phase of the project was concluded in September and the project is now at the stage of dissemination and exploitation of what has been learnt. A conference on the theme Reading Sacred Texts: a Source of Division or a Medium for Positive Encounter? 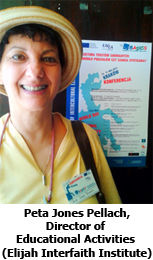 Was held in Krakow, Poland, from May 19th – 21st, demonstrating the bibliodramatic technique and analysing its place in the field of interreligious dialogue. The conference was chaired by Elijah’s Director of Educational Activities, Peta Jones Pellach. On Sunday morning, the 60 participants were divided into three work-shops, one led by Peter Varga from Hungary, one by Anna Loboda of Poland and the third and largest by Yael Unterman of Israel. Different sections of the Book of Ruth were studied in two of the groups (the third used a text from the Christian bible), using various techniques to grapple with issues of ‘home’, ‘being a stranger’, ‘aloneness’ and ‘loss’. The Book of Ruth is set about 1300 years ago, but the experiences of the characters in the book resonate with contemporary people facing issues of migration and alienation, and also raise other questions, including some about family relationships and decision-making. The book is sacred to Jews and Christians, in different ways; the issues are universal. There are two distinct types of bibliodrama. The European (Christian) method and the method devised by American Jewish psychodrama practitioner, Peter Pitzele, which is know in Europe as ‘bibliologue’. The BASICS program embraces both methods, in accordance with the preference of the facilitator. The former method uses more techniques drawn directly from the field of psychodrama and takes a broad sweep of the text studied, moving directly to the relevance of the text to the personal lives of participants. ‘Bibliologue’ stays closer to the text itself and tends to involve less physical activity. The former style allows for a freer flow of ideas; the latter is more structured. It was suggested at the conference that the BASICS program has actually developed a third type: adding the interreligious element changes the purpose of the activity and thus influences the entire presentation of the texts. In the afternoon, all participants joined for a session analysing the techniques used and the lessons learnt, as well as pre-empting questions to be explored in further depth on Tuesday regarding effective dialogue. Much work was done in small groups, integrating participants with various religious affiliations from the 10 European countries represented, in a lively interchange. On Monday, participants visited Auschwitz Death Camp and also had a tour highlighting the multicultural character of Krakow. Tuesday was the day of formal conference proceedings, with a plenary day at the Jesuit University Ignatianum. The official opening of the program was by the UNESCO representative in Poland, who drew attention to the fact that the day was UNESCO World Day for Cultural Diversity for Dialogue and Development. Presenters were drawn from each of the five partner countries and topics ranged from the use of bibliodrama as a therapeutic tool to a paper which revealed the fate of sacred spaces when the population of a religion leaves or is forced to leave a place. There were papers which questioned whether bibliodrama could truly be classified as a form of ‘dialogue’ and a demonstration of the technique which allowed for the participation of audience members. Although the program was intense, participants were not deterred from an active interchange of ideas in the final session of the conference, where presenters and audience members tried to respond to the challenges and to expand on what had been presented. Although the experience of bibliodrama as a tool for interfaith dialogue has revealed some limitations of the method, including particularly that it is not a technique that appeals to everyone, requiring as it does a willingness to respond creatively and imaginatively in the voices of Biblical characters, it has proven its worth as an option. The methodology is suitable for groups where there is a variety of languages spoken as a first language, although it does require a common language for conducting the session and does not lend itself well to translation, as the flow of the activity is interrupted. However, words are certainly less important than in conventional dialogue, where the essence of the interchange is a verbal exchange. In bibliodrama, movement and gesture can be used to convey ideas. It was acknowledged that the technique works as well for those familiar with the texts, even ‘experts’ on the texts, as it does for those encountering the text for the first time. It reveals surprising depths of reading, new understandings, contemporary resonances. In BASICS, there are three essential components: the participant, the text and the ‘other’. Through bibliodrama, the participant confronts all three. She encounters a text, experiences that text through the eyes of another, and is forced to face her own responses to both the text and to the other. 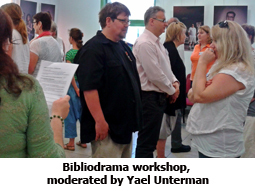 When conducted by a skilful facilitator, a bibliodrama session can be a powerful dialogue. At very least, it paves the way for dialogue, opening up a conversation on ideas and values, both those particular to one tradition and those which are universal. For further information and to see bibliodrama in action, go to www.bibliodramatic.net. One of the most important products of the project will be a book. Our Sharing Wisdom section is an excerpt from the introduction, written by Peta Jones Pellach. 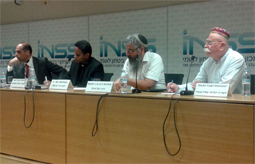 Elijah was proud to be a sponsor of a symposium held by the Israeli Institute for National Security Studies recently, in which representatives from four religions presented their perspectives on ‘Placing Civilians in the Line of Fire’. This was an opportunity for the essentially secular Military and Strategic Affairs Program to engage with religious thinkers and leaders on the ethical and legal aspects of combat, where each of the religions has a position. It was the first such program the INSS has held. Fr Biju Michael, SDB, the Principal of the Salesian Pontifical University’s Jerusalem campus, was the first speaker and he emphasized the fact that in Christianity, the means and the end cannot be separated, meaning that justice cannot be achieved by unjust means. War needs to be a last resort and not every ‘method’ is permissible, even in defensive wars. God is the Master of all life; humans need to do everything in their power to preserve life, and not to take it. Sheikh Fadel Mansour provided a historical survey of how the Druze have survived 1000 years in a hostile environment. Religion governs every aspect of life for the Druze community, meaning that religious law governs warfare as well. A Druze who has blood on his hands cannot marry, so the Druze are extremely careful to engage only in justified war, defending their faith, their land or their community, and go to extreme lengths to protect women and children from any arena of war. Qadi Iyad Zahalka, the Qadi of the Jerusalem Sharia Court, also emphasized the role of religious law in the lives of Muslims. He quoted extensively from the Quran, reminding the audience that Muslims are required to have good relations with their neighbours and that they should always try to negotiate before resorting to war. War is an aberration of the ideal. The ideal is Peace. However, even in the Prophet’s life, Muslims were required to retaliate to attacks against them and thus developed a body of religious law about warfare. Key principles are that retaliation must be ‘equivalent’, that treaties must be upheld and that prisoners must be treated fairly. The final speaker was Elijah Board of World Religious Leaders’ member, Rabbi Yuval Cherlow, who spoke frankly about the failure of Judaism to have developed a proper body of law about the conduct of warfare. Jewish law was developed in a period of over 2000 years when there was no Jewish army, nor a Jewish state. Today, there is not only no ‘Pope’ for Judaism to adjudicate Jewish law, there is not even a dialogue amongst scholars and religious leaders about key issues about how to run a state or an army. Those who wish to find precedents in the Hebrew Bible to justify aggressive war can do so. Those looking for guidance as to the limitations of warfare will find two principles: a limitation on killing trees during the conduct of war; a requirement to ask for peace before resorting to war. Positive as those limitations are, they are far from providing guidance in today’s military situations. In the discussion that followed the presentations, Rabbi Cherlow (Yuval), Qadi Zahalka and Sheikh Mansour found common ground in recognizing the obligation to destroy evil, meaning that war might be necessary to eliminate an enemy bent on undermining morality. This makes having a clear position on the limitations of warfare even more important. Religion should have something to say to political and military decision-makers. Forums such as this one open up this important dialogue. From April 21 to 26, 2013, the Jerusalem municipality held a conference on Green pilgrimage: Jerusalem Symposium on Green Accessible Pilgrimage. 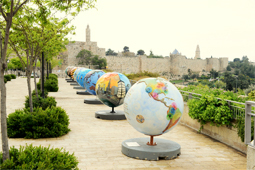 The conference, organized by Deputy Mayor Naomi Tsur, brought together multiple stakeholders in Jerusalem and from abroad, as part of a growing movement of what might be called green pilgrimage, or as we might otherwise refer to it as conscious pilgrimage. The Elijah Institute and its director were one of the partners in planning and executing the conference program (Conference Website – Elijah Page). 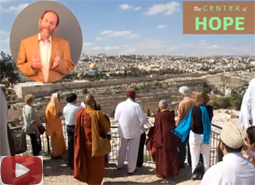 Following earlier involvement in pilgrimage to Jerusalem, and in view of ongoing planning to create the Center of Hope as an interreligious center in Jerusalem, Elijah has a strong interest in delivering the message of interfaith harmony and understanding in the framework of local and international pilgrimages. Conscious pilgrimage is pilgrimage that is mindful of the values of nature and community on the ground. It seeks to incorporate a broad range of concerns into pilgrimage, beyond the activities typically associated with the pilgrimage of a given religion to a given location. Such broader concerns include awareness of the environment, of other pilgrims, of the rich mosaic of local communities and of the broader situation of the focus of pilgrimage within the landscape and “humanscape” of the pilgrimage. These values inform the vision of the planned Center of Hope. Elijah was featured in several panels, reporting on past pilgrimage activities and ongoing plans. One particular session sought to explore what might be an ethical code for the public space. Dr. Alon Goshen-Gottstein spoke of the tension between the image of God as a governing moral principle and the notion of a holy city, and the various ways in which these two notions might be in tension. This generative tension provides the framework for policy making and community action, that must be located within these two ideals. In preparation for the Green pilgrimage conference, Elijah prepared a video, based on a recent meeting held in Marrakech, to be reported in our next issue of Wisdom. To view this video, please click on the image above. 4. Sharing Wisdom: excerpt from the introduction to “The Word and the Act. Bibliodrama in intercultural dialogue”, written by Peta Jones Pellach. Dialogue on a deeper level can be achieved only when we go beyond that which we share and develop a positive appreciation of difference and a recognition that we have much to learn from the wisdom of other traditions. The ideal of a European society based on appreciation of the unique contribution of the wisdom of each religious tradition will require a shift in thinking which will only come about through education and activism. It begins with acknowledging that there are multiple valid, ‘truthful’ belief systems. In the rabbinic literature (1), a strange event occurred during the creation of mankind. The somewhat difficult passage above (which is read as a parable) suggests that ‘Truth’ with a capital ‘T’ existed prior to the creation, in the Heavenly sphere, and that it was thrown down and shattered into pieces as part of the creative process. This was a necessary condition for the existence of human beings – for we humans are not capable of apprehending (or comprehending) divine Truth. All our truths are partial. This is so on an individual level and for different religious traditions. At its most basic level, interfaith dialogue involves people of different religious faiths coming together to have a conversation. ‘Conversation’ in this sense is not limited to verbal exchange alone. ..
One of the challenges for proponents of dialogue is to identify the projects which can bring communities together and those which will assist in moving communities from joint activities to the sharing of wisdom. Even when people show willingness to move to this level, making the wisdom of one tradition accessible to adherents of another, is fraught with difficulties. Continuing the analogy of languages, there is a need for translation. Bibliodrama has the potential to be the ‘translator’. It is a way of making the culture of one religious tradition accessible to another. 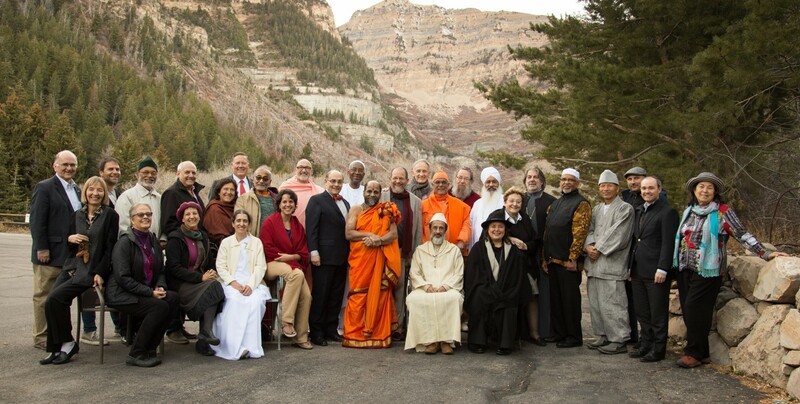 It is a way to present the sacred texts of different religious cultures in an interreligious context authentically. In doing so, we are able to discover the common human values, the universal moral values identified by Berlin, while at the same time we recognise that they can be expressed multiple ways. More than that, we will discover in each tradition elements of Truth unique to it, wisdom from which we all can be enriched. A bibliodrama experience can be a conversation using words but it has the advantage that it can also be one that goes beyond words. Through using movement and silence, as well as verbal exchanges, bibliodrama transcends the barriers of language and allows participants to communicate with each other authentically. Each participant is enriched through the encounter with the other; each grows in understanding and wisdom. (2) Greenberg, For the Sake of Heaven and Earth: The New Encounter Between Judaism and Christianity, p. 196.